This coupon is only valid through December 20th, so hurry and make use of it! 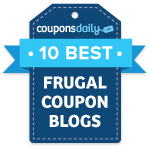 *Remember that the coupon states any item, so look for an inexpensive product. Think clearance, a small hand sanitizer, nail file or any other product priced around $1-$2. This coupon is valid through December 30th. Make sure to read the exclusions! This coupon is valid through December 24th.